As the search for the perfect anti-snoring device continues, I was onto the next one. It was time to try the recently discovered Snoreeze. The company is popular for its other products that treat snoring, like lozenges, strips, and spray. The Snoreeze has also been a product of theirs, but it now has new and improved features, so it was a good time to give it a try. One of the main reasons for snoring is the relaxation, narrowing, and subsequent collapse of different elements of our airways while we sleep. Making things worse, with old age a lot of the muscles in the upper respiratory system tend to lose their muscle tone. When these passages change, our breathing becomes altered, and it becomes more difficult for air to travel through our airways freely. Due to these changes, every time we breathe, vibrations are created by the passing air. These vibrations are at the heart of snoring. Additional factors that may contribute to the problem are smoking, obesity, congestion, and others. If left untreated, the problem becomes worse and starts to affect other aspects of our health. A possible solution to this problem is getting a mandibular advancement device (MAD). Snoreeze is an innovative MAD that helps reduce snoring while you sleep. It is a self-fit device, which means you will be making impressions of your teeth with the help of boiled water. It is made from a soft and flexible material for a more comfortable fit. As a MAD, Snoreeze works by moving your mandible (lower jaw) forward while you sleep. In doing so, it opens up your airways and reduces the vibrations created when breathing. Oral devices are proven to be an effective way to battle nighttime snoring. The mouthpiece is one whole piece with an upper and a lower tray for your teeth. It features double layer technology. Each tray has a soft layer on the inside, which provides a comfortable fit. The layer on the outside is not as soft and made to withstand regular wear and tear. The trays are not connected, so you have full mouth movement, and it’s open design allows you to sleep with your mouth open. The other interesting feature is the micro-adjustment mechanism. With the help of a small screw on each side, you can choose just how far you want the lower part advanced. What are some of the benefits of Snoreeze? Basic device. There aren’t very many parts to this mouthpiece, making it very simple to use. Low cost. This device is much cheaper than most of the other ones that are currently on the market. Ability to swallow easily. Snoreeze opens and closes, so swallowing will not be obstructed. No BPA or latex. This product does not contain highly allergenic chemicals like latex and Bisphenol A.
Adjustability. In case it does not fit perfectly, the device can be additionally adjusted. Short Life Span. The Snoreeze has a life of about 180 days according to the manufacturer. This is much shorter than some of the other devices, which can be used for up to a year. This creates a false sense of affordability, when in fact the constant replacements will drive up your cost. Other devices may have a more expensive price tag, but they tend to last longer. It is not easy to set up or adjust. The instructions included are in a booklet with a ton of steps to get started. Other devices are a simple boil and bite with easier adjustability. 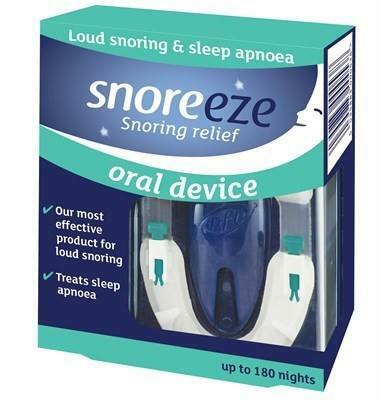 Snoreeze is a relatively new entry on the U.S. market and has not been approved yet by the FDA for snoring. It is forecasted to be approved by the end of 2018. A great feature of the Snoreeze is the fact that it has a 30-day money back guarantee, in case you are not happy with it. The box it arrives in, contains the mouthpiece, a carrying case (the bottom part will be used for taking the impression), and an instruction booklet. Setting the device up and molding it to your bite is a bit complicated, so read the directions carefully. The first step involves boiling some water and pouring it into a cup. After attaching the hinges of the device to the bottom part of the case, you put Snoreeze in the water and leave it for 15 seconds. When it is time, you take it out and bite down on it to create an impression that fits the anatomy of your mouth. The next step involves trying it on and wearing it. In case the fit is not perfect, you can use the screw on the inside of the mouthpiece. By using it, you can decide the level of lower jaw advancement that best works for you. The manufacturer recommends cleaning Snoreeze every day with a soft toothbrush and cold water. Using toothpaste is not recommended, as it may cause some abrasion to the device. Who should avoid using Snoreeze? The manufacturer warns people with respiratory diseases like asthma and emphysema to consult their doctor before use. When the device closes, there is an opening, which may not be big enough to breathe through for people with these problems. If you have any dental problems, consulting your dentist before you buy Snoreeeze may be a good idea. As it puts a lot of pressure on your teeth, you need to have healthy surrounding tissues to avoid problems. People with periodontal disease may find this mouthpiece unsuitable. If you wear dentures, you have to take them out as you go to sleep and put Snoreeze on. The other facial structure, which takes a lot of pressure from the device is the temporomandibular joint. If you have problems with it, this device may not be suitable for you. People who wear fixed braces or who have a bonded retainer are also unsuitable candidates for this device. Possible side effects of using this device include shifting teeth with long-term use. Short-term side effects experienced are dental sensitivity, soreness of the jaw and gums, and excessive saliva, but these typically subside once you become used to wearing the device. If you experience difficulty breathing, jaw pain that doesn’t subside or your snoring becomes worse you should immediately discontinue use of the appliance. Snoreeze has some neat ideas behind it. The customization of the two trays is excellent for creating a comfortable feel when I wore it. Adjusting the level of advancement with a screw is a great idea, but not as effective as I had hoped. Setting the device up took a while and was a bit more complicated than some of the other mouthpieces on the market. The cost was a big factor for me. What seemed like a cheaper option, in the beginning, is a more expensive one in the long run, as Snoreeze is not as durable as other similar devices. Having 30-day money back guarantee may come in handy for a lot of people who buy it. Overall, the device is effective for those looking for an adjustable MAD that is easy to wear and allows you to swallow comfortably. Snoring Pillows – Do They Work? Can Light Therapy Help Stop Snoring?